3 torch juggling behind the back! Tell me that wouldn't amaze your audience. I entertain all ages with comedy and skill. I excel at performing stage shows up to one hour long and strolling through events in very interactive ways. 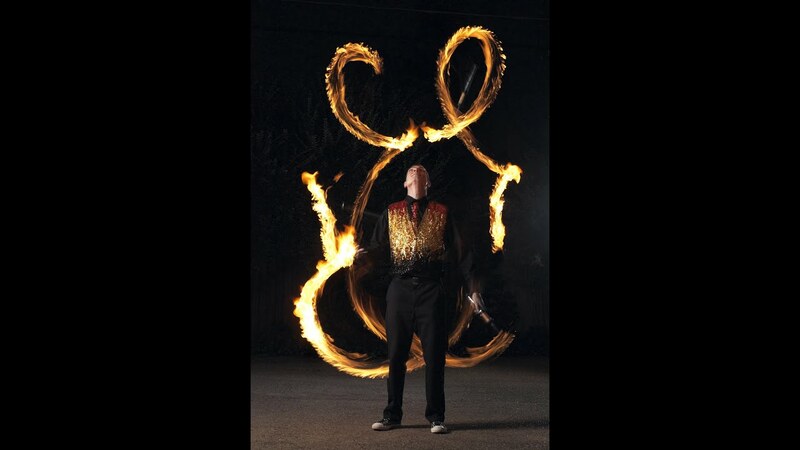 Juggling, Magic, Unicycling, Stilt Walking, LED shows, Fire Stunts, is the short list of my specialties. If you need an entertainer who appeals to a very wide demographic and fits all events big and small, I'm right here. The kids had a blast and it made my party super easy. Hired for my sons 6th birthday party- children AND adults loved it! Super impressed and astounded at the juggling and the magic show! Overall wonderful experience! Insurance: $2,000,000 - My insurance covers many areas for different amounts such as fire and property. I've never had a claim. When you book me this is what you can expect after completing the booking with either a deposit or signed agreement. I'll arrive 30-60 minutes early to set up. 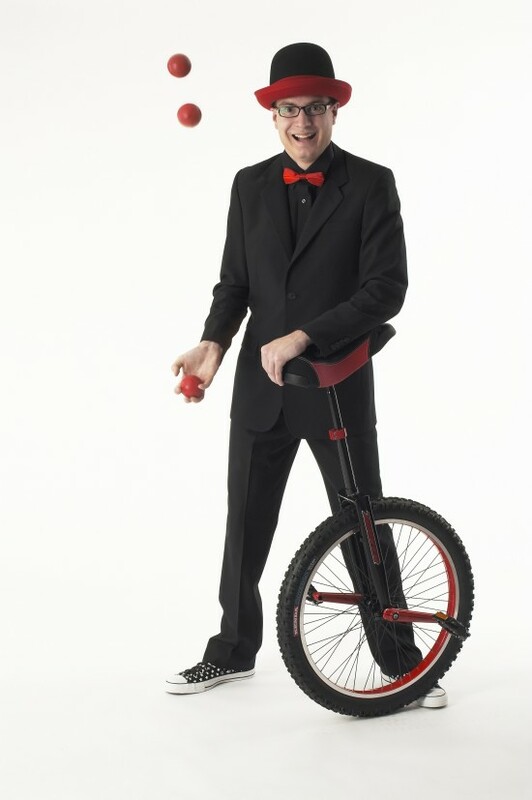 I'll inform you of any last minute changes that need to be made such as making more stage space for unicycling. Once the props have been set, I'll change into costume (usually sequin vest and tie) and entertain the awaiting audience. I like to do some interactive slight of hand tricks until the show starts. The show consists of one comedy and skill routine after another. Some examples include juggling with light-up props in the dark to music, magically escaping from real police cuffs, strait jacket, or canvas bag. Toward the end I'll do bigger stunts like unicycling and pushing a sword through a volunteer's neck. My finale is usually juggling real knives on a balance board dressed in a grass skirt and muscle t-shirt. My extended packages can also include stilt walking before the show, teaching juggling or magic to crowds up to 50 people. basic balloon twisting, press-on temporary tattoos, and incredible FIRE STUNTS. 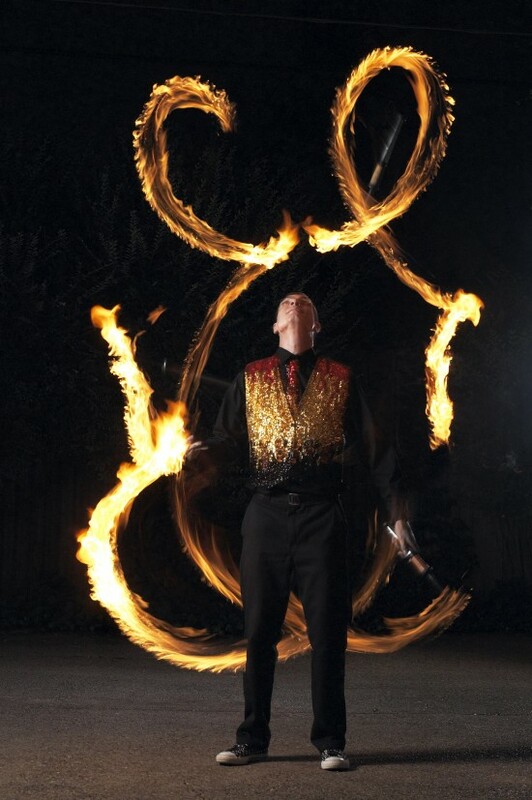 These include fire juggling, fire eating, fire poi spinning, and real fire breathing! Last but not least, I can sometimes book another performer add more variety and entertainment value to your event. 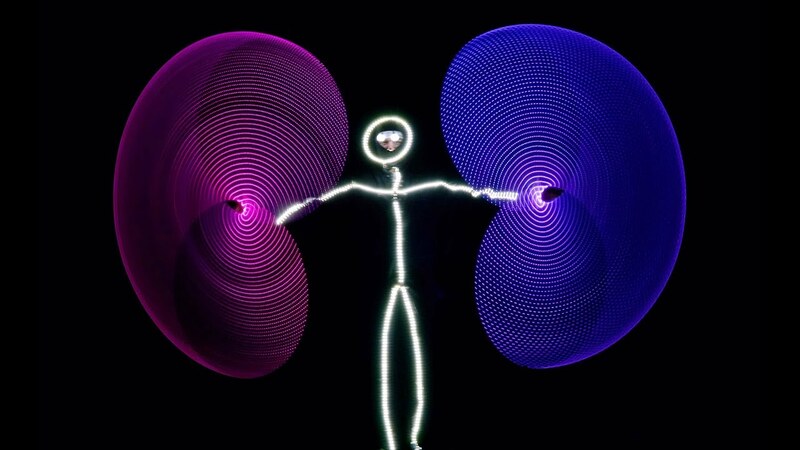 If you want a performer who does amazing tricks with hoop and poi that can light up or set on fire then ask me about Amanda. She is a certified hoop instructor and can teach hoop or poi to your group. Slick performs comedy variety shows for all ages. Experience world-class juggling, comedy magic, interactive stilt walking, unicycling, light-up props, and and fire eating/breathing. Slick can perform/teach before a seated audience or stroll/parade through a large event entertaining the crowd. 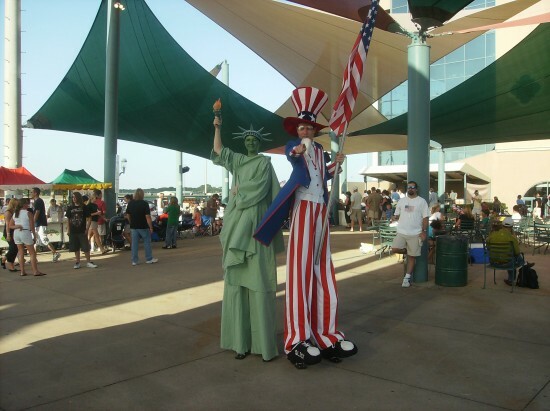 Special characters include Uncle Sam on stilts, Buddy the Elf, and others you may need for your event. Slick has been performing full time throughout DFW since 2002. Call or email to see how he can entertain your guests. Though not necessary, my show is better with music. I only need an electrical outlet for my speaker. For my larger stunts like unicycling and fire, I'll need plenty of space. Always remember, I'm an entertainer, not a babysitter. Enough adults need to be present to handle misbehaving children. The 2 circuses I have performed for. One was a small travelling circuses in which I did stage shows almost daily in a different city. The other was a much larger circus for which I did public promotional shows at huge public events in Dallas.